i think i've fixed the problem with the server.... can anyone download any work or the new binaries? I'm getting no work from project for 30 min now. Message 726 - Posted: 28 Nov 2007, 21:31:57 UTC - in response to Message 724.
darn. i've been getting the same problem myself. the weird thing is that there are available workunits but they aren't being downloaded for some reason. I did a project 'reset' followed by a scheduler update, looks like it went fine communications-wise, but no new program and no new work came down the pipe. Same here, No Work From Project messages, but I was finally able to upload about 40 WUs. Message 731 - Posted: 28 Nov 2007, 21:38:54 UTC - in response to Message 730. Message 732 - Posted: 28 Nov 2007, 21:43:52 UTC - in response to Message 731. The other possibility that i THINK might be going on -- is that when the current version of the binaries got uploaded and the shared memory problem happened, they didn't get put into the system correctly. So Joe is going to try and sign and update binaries one more time, and hopefully these will get in there correctly and then people can download work (if it doesn't happen in the meantime). Message 737 - Posted: 28 Nov 2007, 22:11:22 UTC - in response to Message 733.
weird, what i'm showing from the DB is that there are around 800 or so available workunits. i think the reason that they're not downloading is because there isn't a valid binary for them as far as the server knows (due to our previous problems). Joe is TAing until 8pm tonight, so hopefully when he gets back there we can get the binary problem fixed. That's in about ... two hours, right? I hate time zones. Message 739 - Posted: 28 Nov 2007, 22:17:16 UTC - in response to Message 738. If you say so, I'm not getting any new work anyway. I just get a "11/29/2007 4:28:10 PM|Milkyway@home|Deferring communication 1 hr 0 min 0 sec, because project is down"
I suppose I have my self to blame for joining a Alpha project. I think I leave the project until it has stabilized some and is at least believable Beta and not Alpha ! I am getting the same thing. I think it's still being worked on. I don't mind, I can catch up on work from other projects. Message 779 - Posted: 29 Nov 2007, 18:43:37 UTC - in response to Message 774. You think you should keep the extra credits awarded by your customised boinc client, as you said yourself,Clicky you get getting 4 - 8 c/wu is at least 4x what the latest boinc client was correctly awarding? I've got WU's to this computer. I had to do a detach and then reattach to get them though. I'll check the rest of my computers tomorrow. Message 782 - Posted: 29 Nov 2007, 20:01:00 UTC - in response to Message 774. The reason i reduced the amount of credit you got because it was so far beyond what anyone else was making on a similar computer. If i remember correctly your computers average credit was around 500-600, while the next highest was around 250-275. This looked like an anomaly so i reduced it (along with all the others around there) -- these seemed to be the computers that were getting 10k+ credit for work units and things like that. 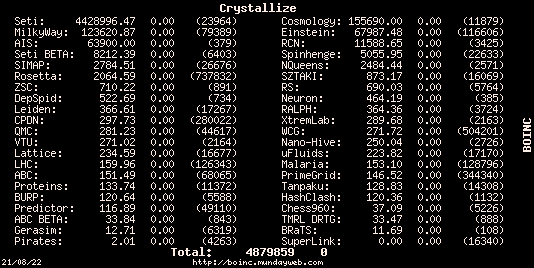 If you were honestly crunching and thats what BOINC was giving you because your computer was highly optimized i apologize. Either way, if you're crunching through workunits super fast the credit you gain now that the server is back up and running should be quite high with the fixed credit.